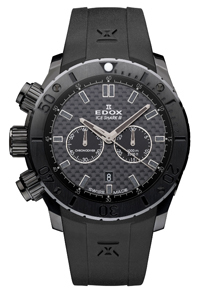 Swiss watch brand Edox has announced the release of new models of men’s watches Edox Mens 10,304 37N2 GIN Iceshark III Limited Edition Chronodiver, world premiere at the upcoming Baselworld-hour exhibition of 2012 in March this year. The company introduced a new product as a chronometer device designed for ice diving. In creating the model took an active part of the world champion ice-diving, Christian Redl. The round case is made of stainless steel 316L, PVD-coated black finish. The body has a diameter of 45 mm and a thickness of 15.6 mm. Unconventional button layout on the left side of the case provides a more comfortable using a chronograph during the dive. Note, water resistant watch is 1000 meters. Unidirectional rotating bezel in black ceramic graded diver markings. The front side of the body is protected by durable sapphire crystal with anti-reflective coating. Time is indexed on carbon black dial central hour and minute arrow, which as well as the overhead of nickel hour markers coated with phosphor composition in black. Small seconds hand put to the side of the dial in the 9 o’clock position. The aperture of the date located in the 6:00 position. The timing functions are displayed on a 30-minute display at 3 o’clock position, and through the central seconds hand. In the new housing built in Quartz Edox 103, based on the caliber Ronda 5021.D. The thickness of 4.4 mm caliber. Hours Iceshark III are supplied to the rubber strap in black, equipped with a buckle made of stainless steel 316L with PVD-coated in black. New released in a limited quantity of 250 copies.